My father, Norman Edwards, started writing these memoirs during his retirement. He typed up the text and included it with photographs in an album. He made photocopies, page by page, which he passed on to me and my sister, Elizabeth Ann. I do not know what his intentions were, whether he hoped to publish them (he was a professional writer, as you will see). The story goes as far as the end of World War II in Burma. I do not know whether he planned to take the story further. However, after a heart attack in 2006 he no longer had the energy to write and he died on 8th January 2008. The title page of the album originally read 'A brief pictorial history', but the 'brief' has been crossed out - evidently it became longer than anticipated. In transferring it to web pages, I have tried to remain as close to the original format as possible. I have maintained the pagination and the relative positions of the pictures (though they may not be correct if you are viewing on a small screen). I have added some internal links to references within the text. I have also added some external links (obviously not in the original) to sources of additional information. I have tried to be sparing with these, not marking every possible reference to anything that's on the web; you can use Google as well as I can. All these external links are marked with an icon . I have re-touched some of the photos to a small extent, to remove blemishes. In January 2012 I found another album, which evidently was an intended continuation. There are further pages of commentary (from 151 Indian OTU Peshawar to the end. There were also several pages of more pictures, some without commentary, evidently incomplete. These merge into more recent photographs, including some of Aircrew Association members and then merging into family pictures. I have included only the ones relating to the airforce service here. One thing my father taught me was to take care with spelling and grammar. Thus, there were few errors in the original and I have only corrected the most obvious slips. The pictures and text have all been scanned from the originals, but I hope I have corrected all errors in scanning. If you would like to make contact with me, having read these page, you can email me. For efficiency I have split the contents into a number of pages organised roughly chronologically. 1942 5 February Promoted to Leading Aircraftsman. Posted to Brighton. 6 August Transferred to 14 SFTS, Aymer, Ontario. First flight in a Harvard. 11 September Boarded the Mooltan to India. 12 October Disembarked to Worli Reception Depot. 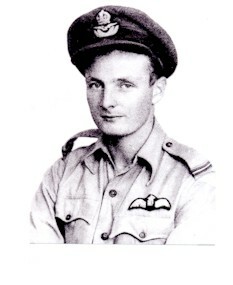 1944 1 January Joined 155 Squadron in Calcutta. 1946 22 May Last flight in RAF, Bhopal to Ambala, via Agra, in a Harvard. Alternatively, all the pages are available in one file - which may take a long time to load. An extract from the book Winged Chariots, edited by Norman Edwards. This chapter is reproduced on a BBC website and concerns the three brothers, Tom, Norman and Walter.